Although bitcoins were in existence since 2009, it has blossomed just a few years ago. With many people investing in it and some still questioning its authenticity, this virtual currency has undoubtedly been a huge hit. It gained a lot of publicity after its price-per-coin rose to US$13,000 in 2018! Various investors have invested in bitcoins for several reasons. 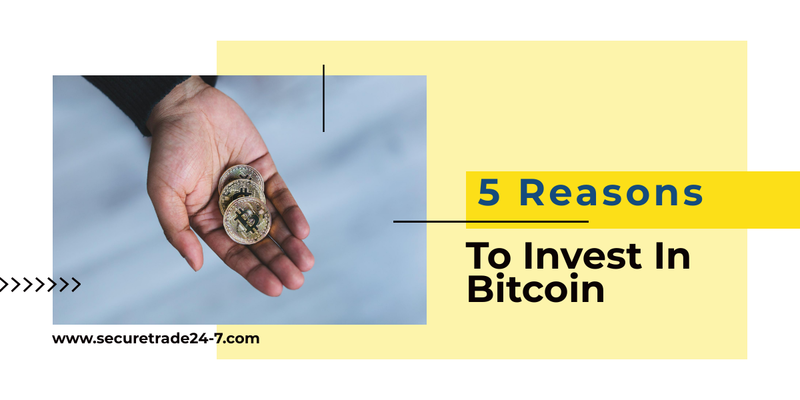 But to know more about the reasons to invest in bitcoin, let us first understand facts about Bitcoin to realize its significance in the market; and hence the benefits of investing in it. Bitcoins are cryptocurrencies, i.e., they are digital assets and form of electronic cash. It is a decentralized currency that can be sent from user-to-user on the bitcoin network without the need for any intermediaries. They are called cryptocurrencies as network nodes verify transactions through cryptography. Having known the basics, let us now see the benefits of investing in bitcoins. The only reason you would invest in something is that it gives a handsome return on investment regardless of the amount. Same goes with investing in Bitcoins. This market is expanding quickly which has resulted in its high returns. The booming popularity of Bitcoins has convinced even the most skeptical investors to invest in them. There is no doubt about its high returns increasing daily, but like every other form of investment, Bitcoins are also subject to risks. But there’s no doubt about Bitcoins being an essential part of your investment portfolio. Cryptocurrencies have a booming market cap and are continuously evolving. Since it is growing daily, the earlier you invest in it, it higher your chances of benefiting from its future development due to its evolution. Bitcoins can be seen as a secure and low-cost alternative to traditional money, but the lack of a centralized authority makes it difficult to control. Hence, many people get intimidated by it. You can use this to your advantage and take the first step towards investing in it as it will give you an edge both in terms of experience and potential gains! Smart investors always diversify their investment portfolio. The benefits of doing so are that not only are you minimizing risks, but also preserving your capital and generating returns by not relying on one source of income. Bitcoins help you to achieve the goal of diversifying your investment portfolio as they are an ideal investment option. But keep in mind that you must not invest your life savings in cryptocurrencies as they are volatile investments. This is the main reason why people start with one bitcoin and later expand as and when they get a hand in it with more experience. Many organizations such as Microsoft and Expedia have started accepting cryptocurrencies as a payment option. With its growing popularity, many more will join in to accept Bitcoins as payment. Buying goods and services through cryptocurrencies further induces investors to invest in it. Last but not least, Bitcoins help you to develop a financial plan. Many have changed their life by investing and setting a financial goal for themselves. Planning an investment strategy helps one have a vision and dream big, and cryptocurrencies help with it. While many talk about investing, only a few can actually do so, and Bitcoins can be a great investment option to start with. But keep in mind that you should never invest more than what you are willing to lose. Do not invest beyond the comfort zone and you can start investing a small amount to get the hang of it. There is no better time to gain experience in this market than now as not all are aware of it and many are skeptical about it. These are the major reasons among others to invest in Bitcoins. As you can see, this cryptocurrency has vast potential, and if you are looking to invest in it, this is the right time. Now you know the facts about Bitcoin and you know its potential for return on investment. So, it is never too late to begin investing in Bitcoins.